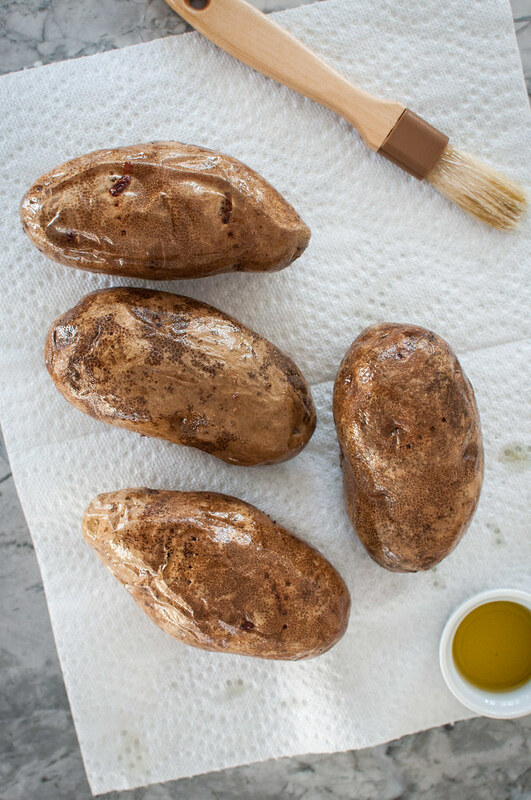 Welcome to lesson 6 of the homemade how-to series: how to cook baked potatoes. In each lesson, I break down the steps for a home cooking skill I searched for often as I first learned to cook, or one that’s always been on my to-learn list. A recipe to showcase your new skill will follow a couple days after the how-to post! Chances are, you searched for this tutorial in a pinch, so let’s dive right in! 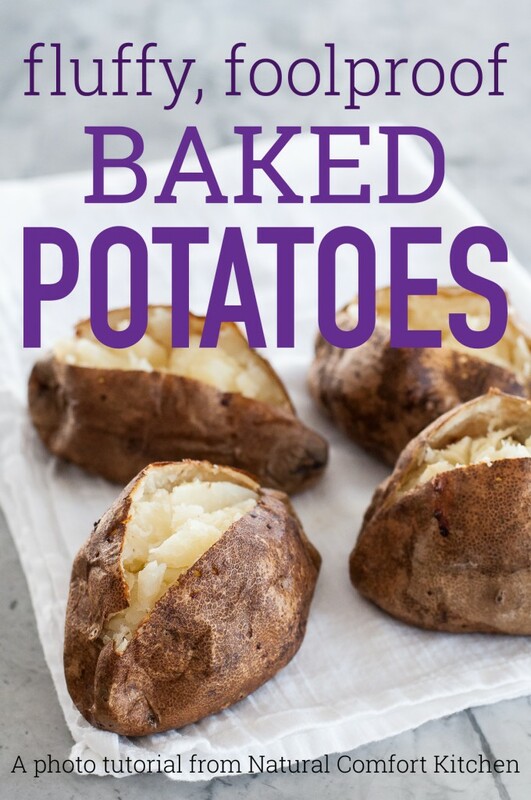 Click here to jump down and read more about perfect baked potatoes and some ideas for how to use them. Essential baked potato ingredients and tools are shown first, and all the optional supplies are pictured second. Preheat oven to 425 (F) with rack in middle position. Scrub the potatoes in cold water and pat dry. Poke firmly with a fork in about 6 places per potato. 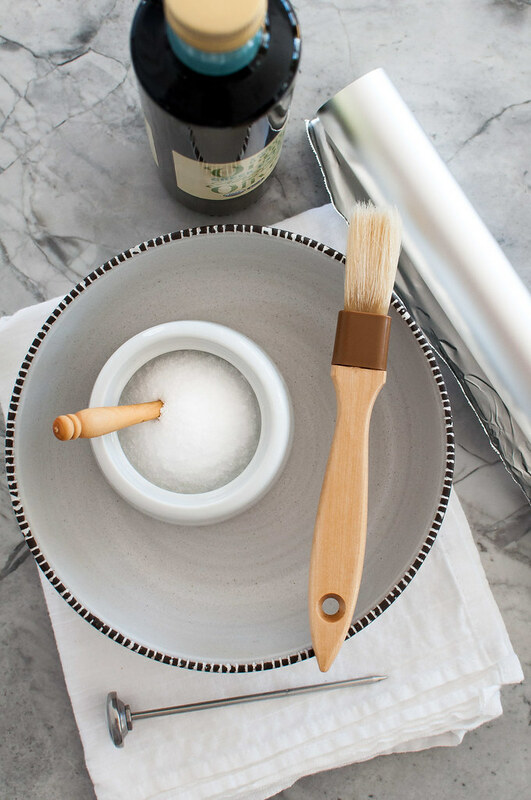 In a medium bowl, mix salt with 1/2 cup hot water until salt dissolves. Toss each potato in the salt water to coat, then shake off excess liquid. Set potatoes directly on oven rack. If you used salt water (optional), place a baking sheet or a piece of foil on the rack below the potatoes to catch any drips. Bake potatoes for 45 to 60 minutes, until soft when pierced deeply with a fork. 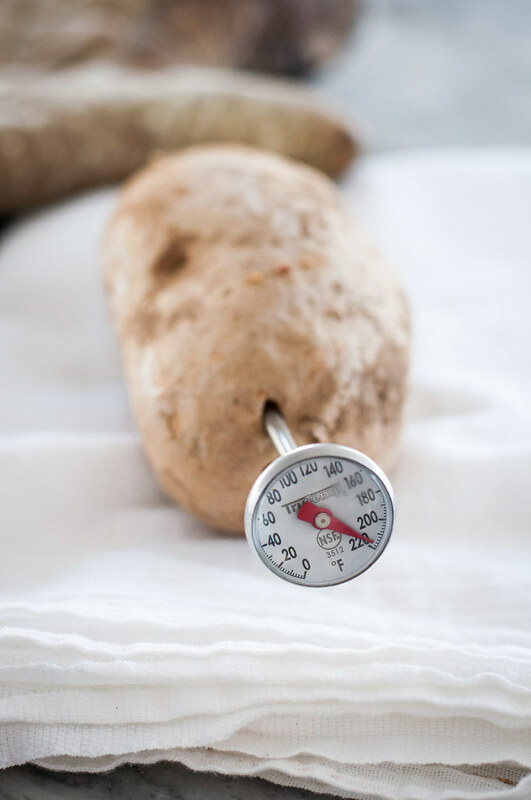 If you have an instant read thermometer, check that the largest potato is at least 205 degrees in the center. Remove potatoes from oven to a plate or towel. Brush the top and sides of each with the oil or melted butter. Place back in the oven with a baking sheet or piece of foil on the rack below them. Bake potatoes another 10 minutes, until slightly darkened and skins are nicely crisped. 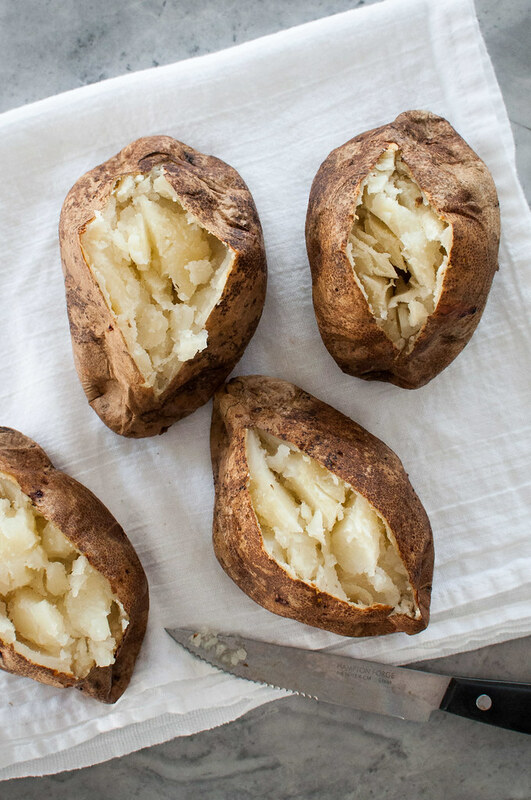 Immediately after baking (even if you don’t plan to serve them right away), cut a slit in the top of each potato, pinch the ends and push them together, to open the potato and release steam. If you wait to open the potatoes, moisture will accumulate inside, causing dense, mushy potatoes instead of light, fluffy ones. Step 5: Top and eat! 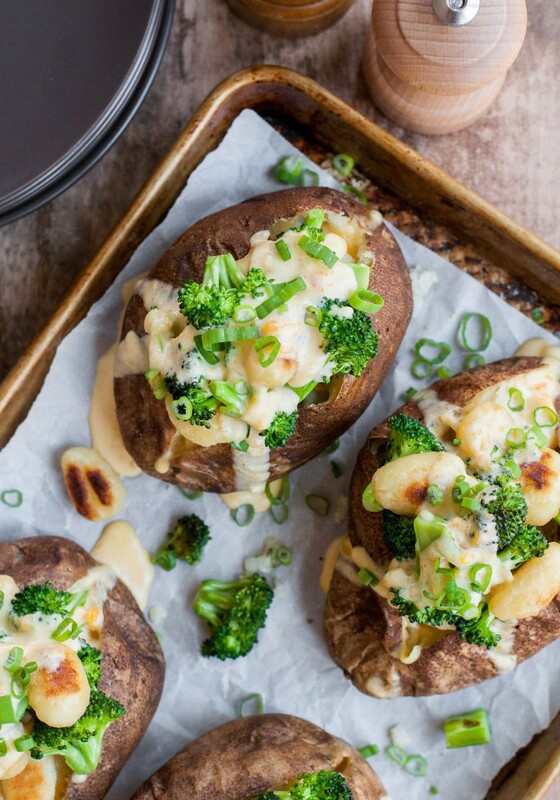 Top baked potatoes with your favorite toppings, from basic to crazy, and enjoy! 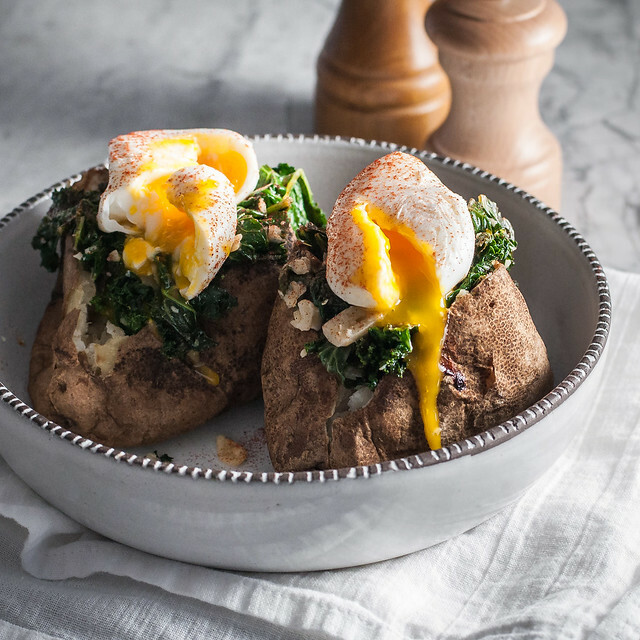 Scroll down for the quick recipe for this breakfast “eggs Florentine” baked potato with parmesan sautéed kale. Makes: As many as you like! Optional step for extra flavorful potato skin: In a medium bowl, mix salt with ½ cup hot water until salt dissolves. Toss each potato in the salt water to coat, then shake off excess liquid. Optional step for crisp, pretty potato skins: Remove potatoes from oven to a plate or towel. Brush the top and sides of each with the oil or melted butter. Place back in the oven with a baking sheet or piece of foil on the rack below them. Bake potatoes another 10 minutes, until slightly darkened and skins are nicely crisped. 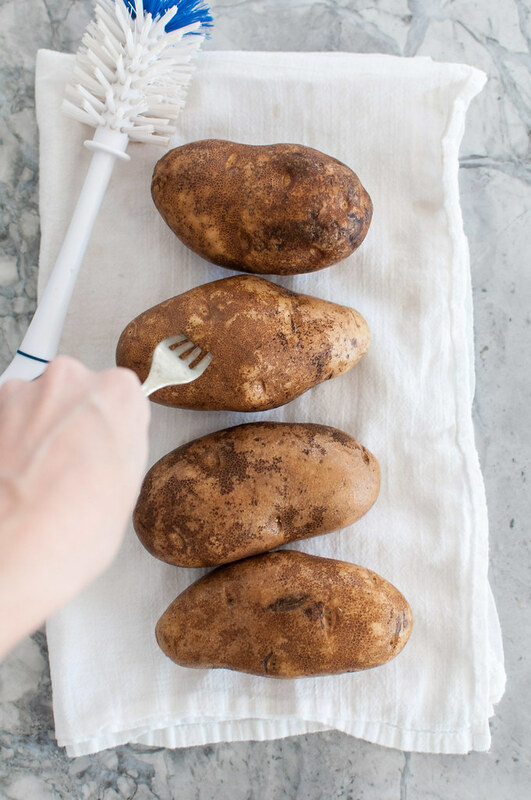 Immediately after baking (even if you don't plan to serve them right away), cut a slit in the top of each potato, pinch the ends and push them together, to open the potato and release steam. If you wait to open the potatoes, moisture will accumulate inside, causing dense, mushy potatoes instead of light, fluffy ones. Top baked potatoes with your favorite toppings, from basic to crazy, and enjoy! To reheat baked potatoes in the oven, preheat to 325. 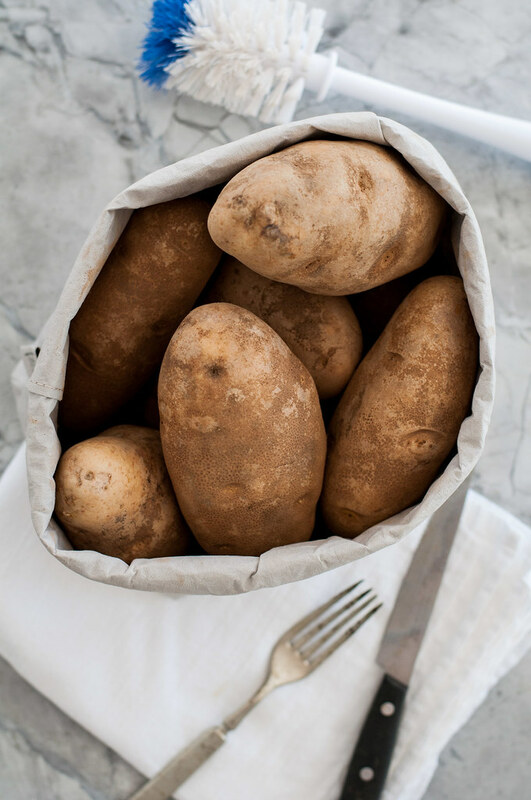 Place potatoes in a baking dish and cover with foil, or wrap each individually in foil, leaving an opening at the top for steam to escape. Heat until warmed through, about 35 minutes. 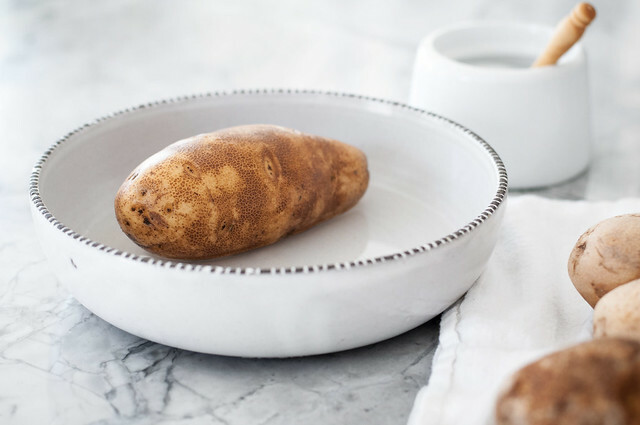 To reheat baked potatoes in the microwave, place a single potato in a bowl. If you don't plan to eat the skin, just scrape the flesh into a bowl and discard the skin. Heat the potato with butter, salt, and pepper until warm. Add cheese, if desired, and heat again in brief intervals until melted. Baked potato methodology is my original adaptation, with influence from Joy of Cooking and Cooks Illustrated. Gnocchi and cheese baked potatoes are a cheesy, over-the-top baked potato recipe! Here’s the link to the recipe so you can put your new baked potato making skills to the test. When it comes to baked potatoes, though, the sky’s the limit. Growing up (and to this day), I usually opted for the classic preparation: butter, salt and pepper, cheese, sour cream, and bacon bits (yes, the weird fake-ish ones). Ain’t nothing wrong with that! 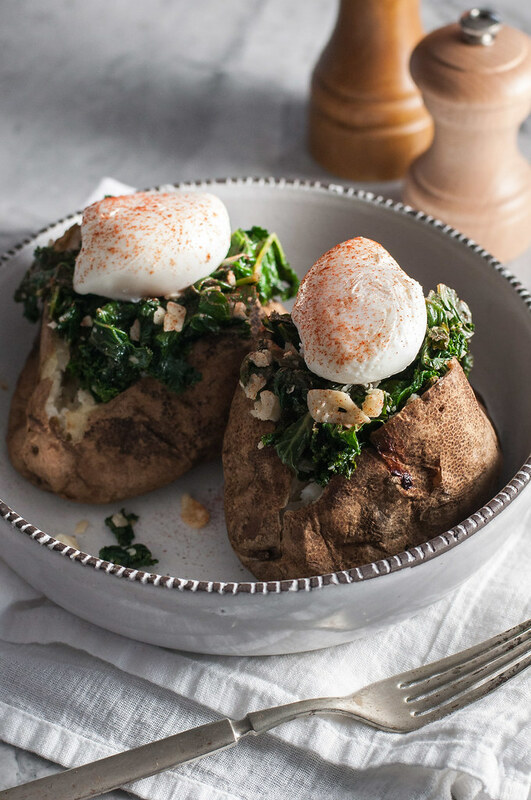 If you’re feeling adventurous and need an excuse to eat a baked potato for breakfast, try this recipe for baked potato eggs Florentine style. Breakfast baked potatoes! Who doesn't like that? 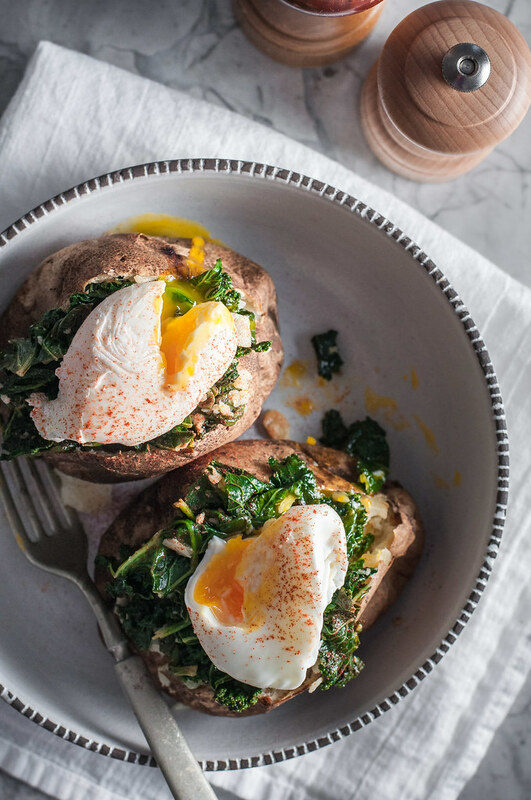 These 'taters are topped with quick parmesan sautéed kale and a nice, runny poached egg for extra drama and deliciousness. Feel free to scale the recipe up or down to serve a crowd or just one or two. Cuisine: Classic with a Twist! 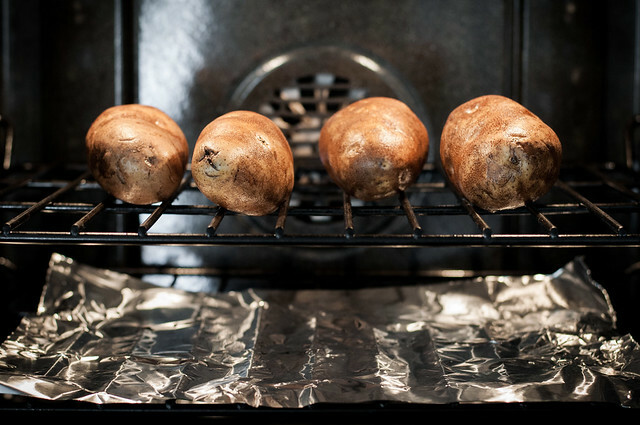 Keep opened baked potatoes warm in a 200 (F) oven, covered loosely with foil. Heat a generous tablespoon of olive oil in a skillet over medium. Add garlic and cook 15 to 30 seconds, stirring. Add greens and stir once they've reduced enough to fit better in the pan. Add a splash of liquid then simmer until nearly evaporated, stirring occasionally. Green should be well wilted by this point. Off heat, stir in parmesan cheese, plus salt and pepper to taste. Remove potatoes from oven and top each with an equal portion of sautéed greens. Cover again and keep warm while you poach the eggs. To poach the eggs (another homemade how-to for this is forthcoming! ), bring a medium saucepan, half full of water, to a boil. Meanwhile, crack one egg into a small ramekin, bowl, or measuring cup. Reduce heat gradually until water maintains a very low simmer. Stir in a teaspoon of vinegar, then use a spoon or spatula to swirl the water in the pan, creating a whirlpool in the center. With the dish touching the surface of the water, gently drop egg into the whirlpool then allow it to cook untouched for a minute. If the egg is sticking to the bottom, use a rubber spatula to gently loosen it. Allow to cook in the barely simmering water for 1½ more minutes. Use a slotted spoon to remove egg to a plate, then repeat the process with remaining eggs. If you're already a pro, you can definitely poach more than one egg at a time and use your preferred method. To serve, top each potato with an egg and dust with paprika. Then enjoy the yolk volcano! Prep and cook time does not include baking the potatoes. Potatoes, with greens, can be assembled ahead of time. Reheat in a 300 degree oven, loosely covered with foil, for about 35 minutes while you prepare the eggs. 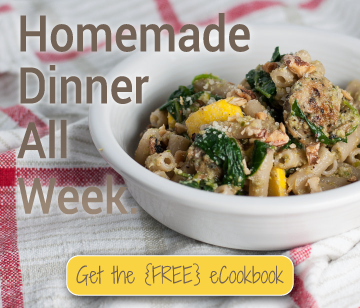 Recipe is gluten free, meatless, and vegetarian (if vegetarian parm is used). Given the options for toppings that we’ve already discussed, and that abound online, it’s clear that baked potatoes are a superior, simple comfort food. While they’re not quite as nutrient-dense as the trendy sweet potato, they’re still a totally plant-based dinner option, a whole food with plenty of fiber and no fat (until you get going on the toppings, at least). 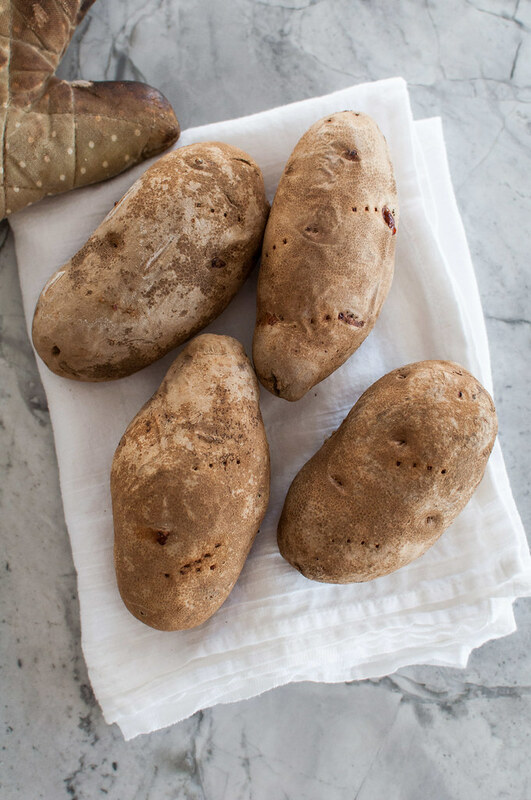 If you’re looking to cut down on even natural sugar, a baked russet might be the perfect choice for your next dinner. I also find that russets bake a much more neutral “canvas” for a range of toppings, and there’s no need to use overly salty toppings to “cover” the sweetness of baked yams. The benefits of baked potatoes go beyond just taste, versatility, and health, though. They don’t break the grocery budget bank, even if you opt for organic spuds, and if you do it right, baked potatoes are perfectly make ahead friendly. The key, and the biggest thing I learned when testing out different baked potato methods, is to open them right after they’re done baking, regardless of when you plan on consuming them. That way, you let out moisture in the form of steam, so the inside of the potato stays flaky and fluffy, not dense and gummy. I’ve been the victim of one too many bad homemade baked potatoes, and the problem wasn’t always in what I did after baking them. Today’s homemade how-to is the result of a bit of research and testing, so I finally nailed down the proper oven temperature, cook time, and other details that seem minor but can make or break baked potato success. Leave any additional questions in the comments below, and I’ll do my best to answer! Do I have to use russet potatoes? To be honest, I didn’t test other types of potatoes for this tutorial. Why? 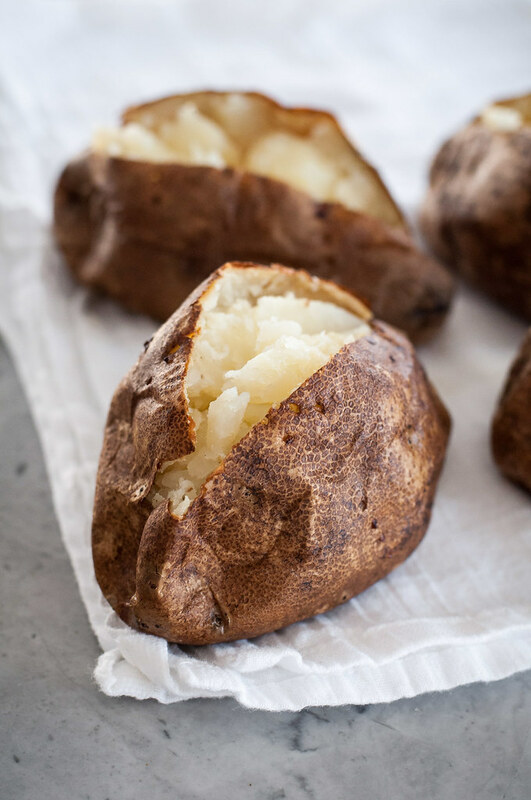 I’m going for the classic baked potato in this tutorial, and I already know that the moisture and starch levels in other types of potatoes won’t yield that same fluffy, flaky texture inside. They’ll also require different temperatures and treatment to yield an edible baked potato. My opinion is this: if you want a baked potato that’s not sweet, always choose russets. Should/can I eat the skin? Yes, you can, and it’s definitely loaded with fiber. In my experience, this is a preference we develop early in life. Growing up, my parents routinely removed our baked potatoes from the skin for us (spoiled!) before they were even served, so I’ve never been a skin eater. That said, in testing the bonus steps for crispier, tastier potato skins, even I found the skins to be highly edible, delicious even, with a quick saltwater seasoning and a final crisp of the oiled skins. So, if you like to eat the potato skin, don’t ditch the bonus steps! Why bake them at such a high temperature? Baked potato recipes are all over the place when it comes to temperature. Ina says 350, which once left me with a severely undercooked baked potato dinner. America’s Test Kitchen goes as high as 450. Why did I settle on 425? I like the texture of the finished potato at slightly lower temperatures, but I like the crispy skin and shorter baking time at higher temperatures. Baking at 425 is the best of all worlds for me. Anything and everything! Here are some of my favorite topping combos, as well as less conventional uses for leftover baked potatoes. Top with olive oil, feta, kalamata olives, sauteed onions and peppers, and fresh herbs for a Mediterranean potato. Go with the classic combo, just a little fancier: herbed butter, fontina or gouda cheese, creme fraiche, and chopped chives (plus some pan fried, crumbled prosciutto if you want a little meat!). Keep your ‘tater vegan by loading it with vegan butter or your best olive oil, avocado, vegan sour cream, and pickled red onions. Slice leftover baked potatoes thin and put them on homemade pizza (substitute them for sweets in this pizza recipe). Mix them (sans skin) into vegetable soup before blending, for a gluten free thickener. Try them in broccoli cheese soup for starters. Save a step in this frittata recipe by using already baked potatoes, peeled and diced.